I will try and do a few of these a month. Tribute Series will showcase talented writers and poets whose works continue to inspire me. 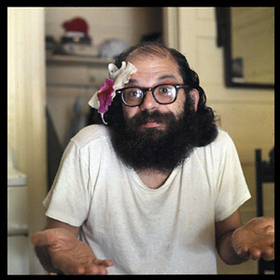 Allen Ginsberg was an American poet. Reading about him in Wikipedia, as you might do if you’ve never heard of him, you’ll see that he was a homosexual; at least most of the time (see Elise Cowen) I hope that doesn’t scare you away, because as Elton John has clearly proved through song (Tiny Dancer par example lol) sexual orientation doesn’t mean you can’t right some powerful piff. It’s funny how we are introduced to new art. I find that with me, I’m always listening, reading, viewing, experiencing in some way, some art-form, when they reference some other artist or art. Either way…either way is fine.